Spray drift, movement of a pesticide through air, during or after application, to a site other than the intended site of application, is considered to be the most challenging problem facing applicators as well as manufacturers of pesticides. Although it may occur in the form of vaporized chemical active ingredients escaping the application area even long after the spraying is done, drift is often associated with the physical movement of spray droplets away from the target site at the time of application. Spray drift is not a new problem. It started nearly 50 years ago with the invention of pesticides. Problems associated with drift have always been in the minds of people who apply pesticides. However, spray drift has become a very serious concern in the last decade mostly because the pesticides we use today are more potent, and it takes only a small amount of drift to cause injury to nontarget plants and animals. During the last several years, about two-thirds of all the formal noncompliance reports filed by the Ohio Department of Agriculture has been related to drift damage. The number of such complaints is likely to increase in years to come because of recent growth in number of farmers planting genetically-altered crops that are resistant to non-selective burndown herbicides such as Roundup.® When crops produced from conventional seeds are grown next to a field of a genetically-altered crop, even a small amount of drift of a non-selective herbicide from the field of herbicide-resistant crop towards the field of conventional crop may result in serious damage to the conventional crop. Complete elimination of spray drift is impossible. It is likely to occur wherever liquid sprays are applied. However, the problems associated with drift can be reduced to a minimum if chemicals are applied with the proper selection and operation of equipment under favorable weather conditions. Why do we ne​ed to reduce spray drift? It may affect the health and safety of susceptible human and livestock populations. Spray characteristics, such as volatility and viscosity of pesticide formulation. Weather conditions at the time of application (wind speed and direction, temperature, relative humidity and stability of air around the application site). Operator care, attitude, and skill. After wind speed and direction, spray droplet size is the second most important factor affecting drift. Good coverage is essential for insecticides and fungicides because of the small size of the target organism. Therefore, small-to-medium size droplets are desirable when applying insecticides and fungicides because they provide better coverage. However, small droplets can drift long distances because of their light weight. Spray droplet diameters are measured in micrometers. A micrometer is 1/25,000 of an inch and usually referred to as a micron. For reference, the thickness of a human hair is roughly 75 to 100 microns. Drops smaller than 150 micron in diameter would generally pose the most serious drift hazard. According to a study conducted at The Ohio State University, drift is far less likely to be a problem when spraying with droplets of 200 micron and larger in size (Zhu et al. 1994). The same study indicates that spray particles under 50 microns in diameter remain suspended in the air indefinitely or until they evaporate. They should be avoided because there is no way to control deposition of these small droplets. Nozzles which produce relatively high number of small droplets should not be used unless there are no other alternatives. An applicator committed to keep pesticide drift under control will always find a way to reach this goal. Several recent developments have been aimed at modifying existing equipment to increase deposition efficiency of the more effective small droplets while reducing the potential for drift. In general, this has been accomplished by using new nozzles/atomizers, air-assist technology, or some kind of shield or shroud to overcome the drift-producing air currents and turbulence that occur around the nozzle during spraying. This publication contains information only on some of the new nozzles that have been found highly effective in reducing the number of small, drift-prone droplets. A detailed review of commonly-used strategies one can adopt to reduce drift are given in Ohio State University Extension Publication Bulletin 816 "Reducing Spray Drift." Almost all major agricultural nozzle manufacturers have recently introduced their version of so called Low-Drift nozzles. Delavan Company has their low-drift nozzle in the family of "Raindrop" series of flat-fan nozzles. 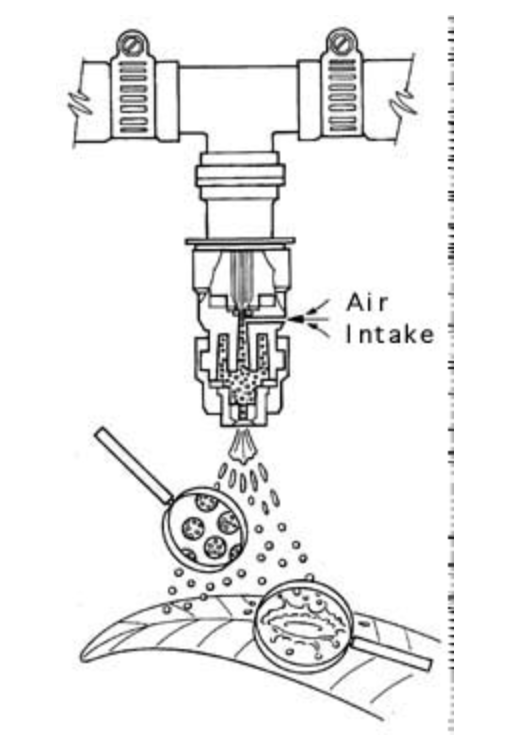 Spraying Systems Company calls their low-drift, flat-fan nozzle "DriftGuard" (Figure 1). These nozzles are designed to create larger droplets at the same flow rate and operating pressure than comparable standard flat-fan (SFF) nozzles. This has been accomplished by adding a pre-orifice to the nozzle tip assembly just ahead of the conventional discharge orifice. SFF tips have straight bore that carries liquid from boom to the tip. With these new low-drift nozzles, liquid enters through a small orifice and flows into a pocket machined into the nozzle body. The liquid then flows from this chamber into a short passage and out of the discharge orifice. The pre-orifice reduces liquid velocity and pressure at the exit orifice, creating larger droplets to reduce drift significantly. According to one of the manufacturers of these nozzles, their low-drift nozzle tips reduce the number of droplets smaller than 200 microns by 50 to 80 percent. 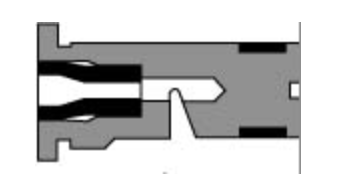 This nozzle, introduced by Spraying Systems Co. can be used for the same purposes as a standard flat-fan (SFF) nozzle (Figure 2). The advantages of the Turbo TeeJet nozzles are twofold: they can be operated at a wider range of pressures (15 to 90 psi as apposed to 30 to 60 psi with SFF ), and they produce fewer drift-prone droplets compared to the same size of a SFF. A hybrid between SFF spray tips and reletively clog-free flooding nozzles, Turbo TeeJet has a pre-orifice at the tip that slows liquid velocity. The resulting larger droplets are less likely to drift but still provide good coverage with a uniform spray pattern. These nozzle tips fit in standard Quick TeeJet flat-fan nozzle caps as well as threaded caps, and are available in 0.1 to 0.5 gal/min capacities. Turbo Flood nozzles introduced by Spraying Systems Co., combines the precision and uniformity of flat spray nozzles with the clog-resistance and wide angle pattern of flooding nozzles. The major design difference between the new Turbo Flood nozzles and the conventional flood nozzles are a pre-orifice at the point of liquid entrance to the nozzle, and a turbulence chamber at the exit point. This new design has resulted in more uniform droplet sizes and improvement in pattern uniformity over existing flooding nozzle designs. At common operating pressures, Turbo FloodJet nozzles produce droplets that are 30 to 50% larger than those produced by standard flooding nozzle tips. In addition to improvement in droplet size, Turbo FloodJet tips provide a better spray pattern than conventional flood tips. This is shown above. (Source of figures: Spraying Systems Co. Wheaton, IL). These nozzles are designed to produce larger droplets while reducing the percentage of fine droplets. TurboDrop nozzles (Figure 4) are manufactured in Germany by Agrotop Company and distributed in the US by Greenleaf Technologies (Covington, Louisiana). 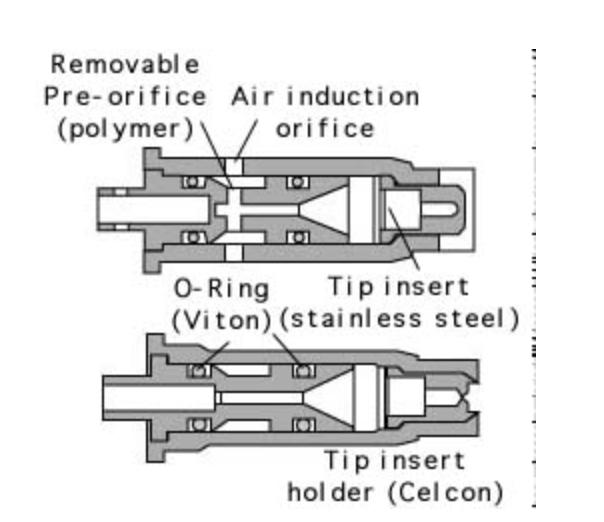 TeeJet Air Induction nozzles (Figure 5) are manufactured by Spraying Systems Co. (Wheaton. IL). As with other low-drift nozzles, TurboDrop and TeeJet Air Induction nozzles have a pre-orifice ahead of the exit orifice to reduce the pressure exerted on the liquid at the point of discharge. 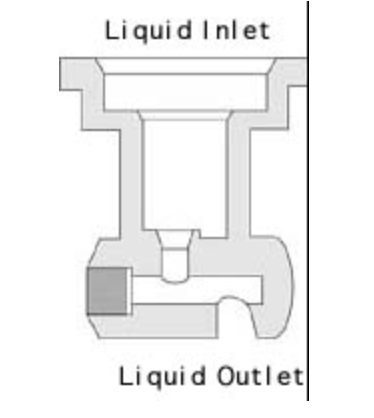 The lower part this nozzle (Figure 4) represents a typical standard flat-fan nozzle set up. The top part of the nozzle contains a pressure reduction chamber with a narrow port used to draw air into this pressure chamber. 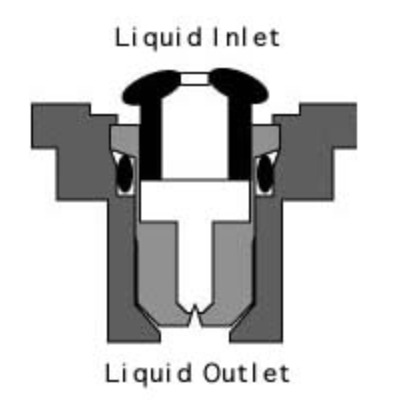 The exit nozzle does not control the output rate, but rather forms the desired pattern. Therefore, a standard flat-fan tip with a larger orifice can be used to produce larger droplets. The flow rate is controlled by a ceramic orifice plate located at the bottom of the first section. As the liquid passes through the orifice plate, as a result of the pressure drop created by this venturi, air is sucked into the nozzle body. In the mixing chamber, air and spray solutions are blended much like a water aspirator. According to information presented by the manufacturer of this nozzle, as the liquid is discharged from the nozzle tip, droplets filled with air are produced. The recommended operating pressure range for these nozzles is 40-90 psi. The AI TeeJet Air Induction nozzle produces a 110 degree flat-fan pattern. Its one-piece design eliminates the need for manually matching up spray tips with the venturi size. With a recommended pressure range of 40-100 psi, this nozzle also uses a special venturi design to draw air into the nozzle body, incorporating the air droplets into the sprayed liquid droplets. This increases droplet size, and has been shown to reduce downwind particle drift significantly. The spray tip is color coded for easy identification and incorporates a stainless steel exit orifice. Drift can be reduced in many ways, including proper use of the conventional nozzles. However, the new "low-drift" nozzles discussed in this publication further reduce the risk of creating drift. They are more effective in reducing the number of small droplets than what can be accomplished using the conventional nozzles. In a recent study conducted at The Ohio State University by Derksen et al., (1997), effectiveness of two "low-drift" nozzles (Turbo TeeJet and TurboDrop) in reducing drift were investigated (See OSU Extension Fact Sheet, AEX 524-98). This was accomplished by measuring droplet sizes, and deposition distances of droplets in a wind tunnel using the low-drift nozzles and comparing the data from these measurements with those obtained from a standard XR flat-fan nozzle. Compared to standard XR flat-fan nozzles, both TurboDrop and Turbo TeeJet "low-drift" nozzles produced much fewer drift-prone droplets, and drift distances of droplets measured in the wind tunnel were much shorter. To obtain the lowest risk potential for drift, one should choose a combination of various strategies including using new nozzles discussed in this publication. Derksen, R.C., H.E. Ozkan, R.D. Fox and R.D. Brazee. 1997. 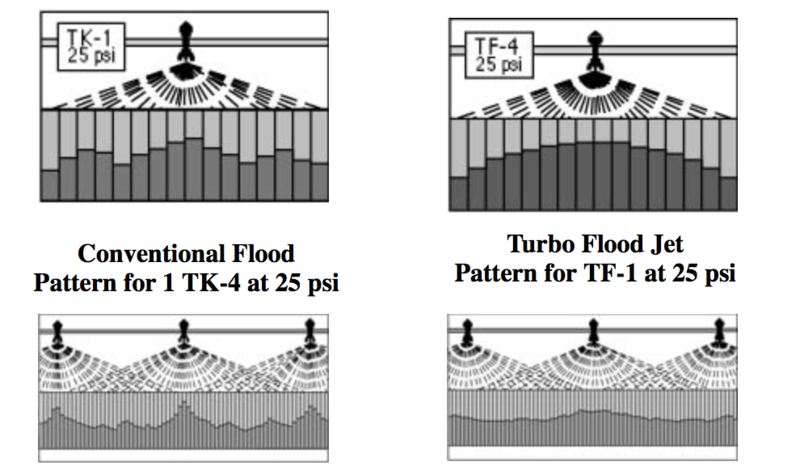 Effectiveness of TurboDrop and Turbo TeeJet nozzles in drift reduction. ASAE Paper No. 971070, ASAE, 2950 Niles Road, St. Joseph, MI 49085. Zhu, H., D.L. Reichard, R.D. Fox, R.D. Brazee and H.E. Ozkan. 1994. Simulation of drift of discrete sizes of water droplets from field sprayers. Transactions of the ASAE, Vol.37, No.5, pages 1401-1407. NOTE: Disclaimer—This publication may contain pesticide recommendations that are subject to change at any time. These recommendations are provided only as a guide. It is always the pesticide applicator's responsibility, by law, to read and follow all current label directions for the specific pesticide being used. Due to constantly changing labels and product registrations, some of the recommendations given in this writing may no longer be legal by the time you read them. If any information in these recommendations disagrees with the label, the recommendation must be disregarded. No endorsement is intended for products mentioned, nor is criticism meant for products not mentioned. The author and Ohio State University Extension assume no liability resulting from the use of these recommendations.